An interactive platform from RTKL helps designers choose and implement sustainability strategies that will have the greatest impact on triple-bottom-line values. The performance wheel displays values across economic, environmental, and social categories (the three categories of the sustainability triple-bottom-line) and helps designers quickly and easily define their project’s goals and priorities. The international architecture firm RTKL recently released a free online tool called the DART to help designers maximize the value of a project in terms of sustainability goals. 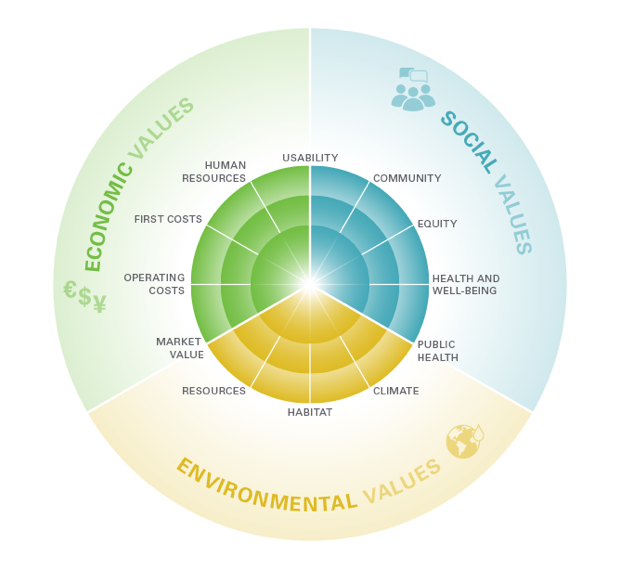 The interactive tool allows users to identify which social, economic, and environmental values are central to the project and to structure a design approach that delivers on those values. This tool is unique, according to Lance Hosey, FAIA, RTKL’s chief sustainability officer, because it takes into account that sustainability goals go beyond environmentalism. “By approaching design first and foremost as a value proposition, we appeal to a larger audience,” Hosey stated in a press release. A performance wheel helps designers identify the values of their client, and the tool provides design strategies based on those values. The strategies are accompanied by value impact ratings to show which influence the most sustainability goals. For example, energy-efficient envelopes have an impact rating of 6 out of 12, while a connection to the outdoors achieves a 9 out of 12: equity, habitat, and community are among the sustainability values that efficient envelopes do not affect. Finally, a priority pyramid shows designers how to implement strategies at a time in the design process that will make them most effective. The DART (which is the name of the tool and not an acronym) will continue to expand as more design strategies, case studies, and information sources are added, according to RTKL. The firm also hopes the tool will eventually be able to calculate how a strategy’s impact may differ according to factors such as project type and region. The release of the tool coincides with the RTKL’s first sustainability report. Editor’s Note: EBN provided RTKL with links to key EBN articles, which appear within DART to help educate designers on design strategies.